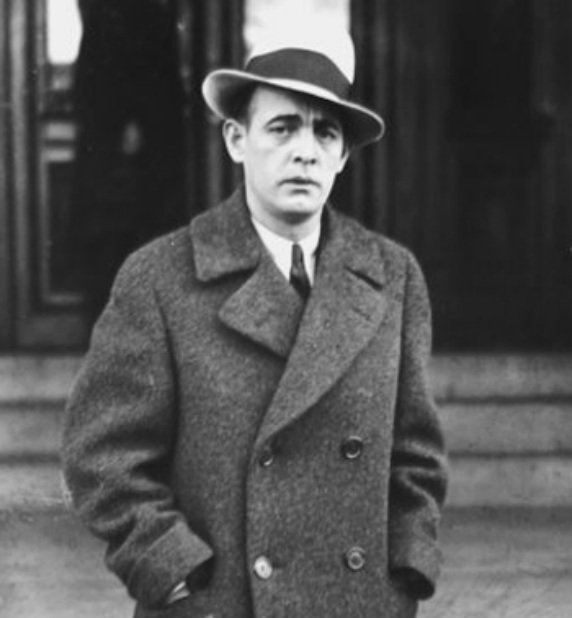 A dapper Jack "Legs" Diamond at one of his many court appearances. Diamond looked tough and was tough. had no lasting friends and no one trusted him. Only his second wife, Alice Kenny, seemed to stand by him …. and she paid a heavy price for her loyalty. between 1916 and 1931. In 1930, Diamond's nemesis Dutch Schultz remarked, "Ain't there nobody that can shoot this guy so he don't bounce back?" Diamond was known for leading a flamboyant lifestyle, and he enjoyed being seen at nightclubs. He was a womanizer, and his best known mistress was showgirl and dancer Marion "Kiki" Roberts. The public loved Diamond, and for a time he was a media darling. It’s unclear how he obtained the nickname “Legs,” but it’s generally believed it was derived either from his being a good dancer or from his uncanny ability to escape his enemies. 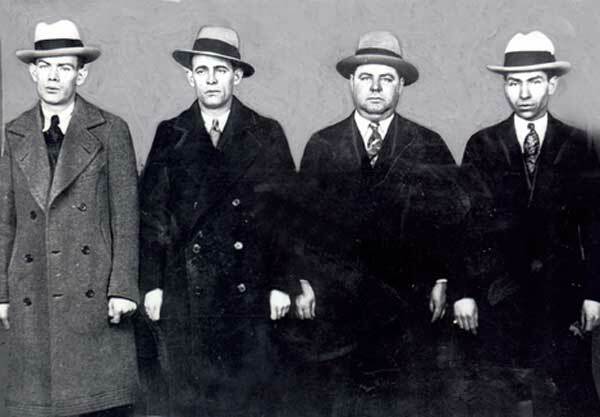 This police lineup photo circa 1920s features Eddie Diamond, left, Legs Diamond, Jacob "Gurrah" Shapiro and Charles "Lucky" Luciano. Diamond was born John Moran on July 10, 1897, to Sara and John Moran, who immigrated from Ireland in 1891 to Philadelphia. Jack's brother Eddie was born in 1899. The Moran brothers struggled through grade school and had little parental supervision at home. Their mother, who was mostly bed-ridden because of severe arthritis and other health issues, died Dec. 24, 1913, from complications of a bacterial infection. Shortly after her death, their father moved them to New York and they settled in Brooklyn. Left mostly on their own, the brothers turned to petty crime and they soon joined the Boiler Gang, a violent street gang of Jewish and Irish-Americans. His first arrest came on Feb. 4, 1914, for the burglary of a jewelry store. He would eventually be arrested more than a dozen times. 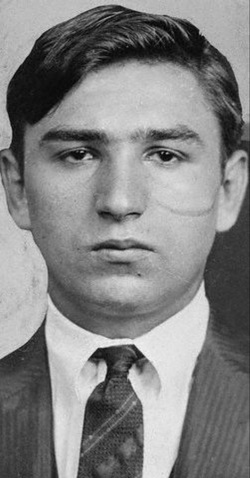 Released in 1921, he and his brother headed to Manhattan where they became associated with Charles “Lucky” Luciano, then a relatively unknown but up and coming gangster. Diamond did a variety of odds jobs for Luciano, who eventually introduced him to his mentor, Arnold “The Brain” Rothstein, a gambler and financial wizard and the most powerful gangster in the city at the time. Diamond went on to become Rothstein’s bodyguard and eventually Rothstein cut Diamond in on his very successful heroin operation. With cash flowing in, the Diamond brothers made their first mistake by deciding to branch out on their out into the bootlegging business. They planned to hijack truckloads of liquor owned by Owen “The Killer” Madden, “Big Bill” Dwyer, and other Irish gangsters and sell them to rival gangs. Not a good idea since Madden and the others were tired into a larger syndicate run by Dutch Shultz, Luciano, Meyer Lansky and other more powerful mobsters. Once word got around who was hijacking the trucks, the Diamond brothers lost any syndicate protection they enjoyed, and they became fair game for anyone. On Oct. 24, 1924, as Diamond drove his blue Dodge sedan uptown along Fifth Avenue, he pulled up to the intersection at 110th Street (the boundary of both Harlem and Dutch Shultz’ territory). A large black limo pulled alongside Diamond. According to eye witnesses, a shotgun appeared from the back window of the limo and opened fire. Hit by the gunfire, Diamond still managed to duck down and hit the gas. Without being able to see where he going, he managed to drive more than block before he lifted his head. The limo was gone and Diamond was able to drive himself to nearby Mount Sinai Hospital where doctors removed pellets from his head, face and feet. Soon after this incident, the brothers realized they needed some protection, and so they turned to Jacob “Little Augie” Orgen (Orgenstein), a Jewish gangster who ran several rackets in Lower Manhattan and was one of the few people didn't seem to want to kill the brothers. Basically, Orgen's only interest was to increase his power base and get into the "big leagues" with Luciano, Lansky and the others, so he needed muscle and the brothers provided that for him. narcotics rackets. The relationship went well until Oct. 15, 1925. At about 8:30 that night, as Orgen and Jack Diamond were finishing their daily rounds of collections and meetings, they were approaching the corner of Delancy and Norfolk streets in Lower Manhattan when three men approached them and opened fire. Orgen was fatally shot in the head, and Diamond was shot twice on the right side. He was taken to Bellevue Hospital, where emergency surgery was performed and he eventually recovered. The police interviewed Diamond, but again he refused to identify any suspects or help the investigation in any way, leading police to suspect Diamond was an accomplice. They charged him with murder, but without proof the charge was soon dropped. The murder was never solved, but it’s commonly believed the shooters were hired by or included Louis “Lepke” Buchalter and his partner Jacob “Gurrah” Shapiro, who was seeking to move in on Orgen's rackets. It’s unknown if Diamond was part of the plot, but after his release from the hospital, Diamond was given Orgen’s bootlegging and narcotics operations by Buchalter and Shapiro while they took over Orgen's other rackets. 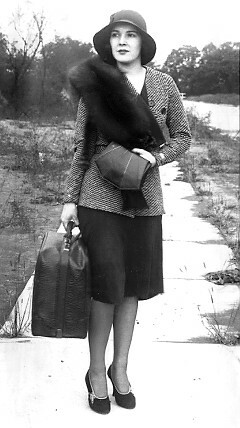 Marion "Kiki" Roberts in street clothes and work clothes.